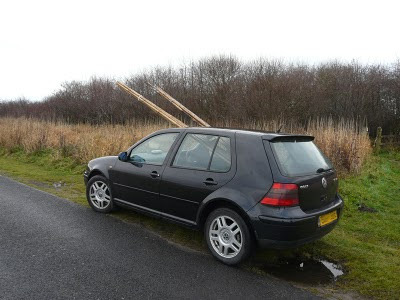 As there are now no leaves left on any trees at Druridge, at all, it's time to pack-up the ringing site, which basically means taking away our bamboo net poles for winter storage. I've not had time to work out how many birds we have done this season, but I will and post some figures on here soon. The wind had moved some of the poles deep into the bushes, so I spent most of this morning crawling under and through blackthorn and hawthorn bushes to retrieve them (seemingly it's what trainee ringers are there for). I now look like a self-harmer. Whilst retrieving the poles, I came across a mixed flock of finches, mostly siskins (about 20 of these) moving through, feeding on alder cones. Today was also WeBS count day, the Budge fields and the big pool are both brim-full, a large sand bar was blocking the Dunbar Burn mouth, it's flowing a bit now, but is well backed-up. 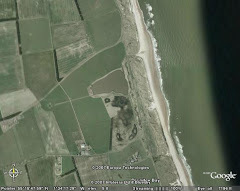 If you are heading to Druridge soon, take your wellies, you'll need them to get to the Oddie hide. The cows have mysteriously disappeared from the Budge fields, have they been rustled? I thought they were supposed to be on the for the winter, there is certainly more work for them to do. Lots of teal on the Budge fields (I notice the green-winger was at Cresswell today, it would be nice to see it at Druridge before the turn of the year! ), the wigeon were all on the big pool and 35 curlew were on the adjacent fields.